There is a long history of prejudice against the Jewish people of Ethiopia. For the two millennium they lived in the Gonder area of Ethiopia, their livelihood was primarily based on farming, blacksmithing, pottery and weaving. Although these skills provided much needed products to their non–jewish neighbors, these trades were looked down upon. There were also many crazy stories such as the Jews having evil eyes that caused bad things to happen to people. 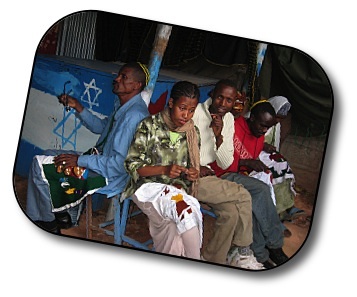 Jews in Ethiopia were labeled with several derogatory terms – inculcating the population with a culture of discrimination. Governing bodies have also participated in the oppression of the Jews there. At various periods of time, and under different governments, they were not allowed to own land, hold certain jobs or obtain an education. The new government has changed these discriminatory laws, but it cannot force the change of heart of a people long biased against the Jews. My very first day in Ethiopia a man was talking very excitedly to the leader of the synagogue about his child being called the derogatory term for Jews in school by another child. He wanted the leader to write a letter to the school demanding that they do not allow this term to be used by the children. Although the Jewish children are now allowed an education, they still have to struggle against the prejudice of their culture, as do their parents in the streets. Jobs are hard to obtain for all Ethiopians, but even harder for the Jews because of this prejudice. It is also hard for the Beta Israel who have just migrated in the past years to the city (in hopes of making Aliyah) to practice their skills in their one room huts, or to obtain jobs for which they have no training. This is one of the reasons that we have this web site, to help these people with a livelihood of their skill, while they await their Aliyah to Israel. The Beta Abraham, who have been in the city several hundred years (see About the Estranged), have had more training and education opportunities than those who just recently moved to the city. However, they still live in poverty conditions and struggle against the prejudice. In fact, many keep their Jewish identity a secret in order to not inhibit their opportunities. 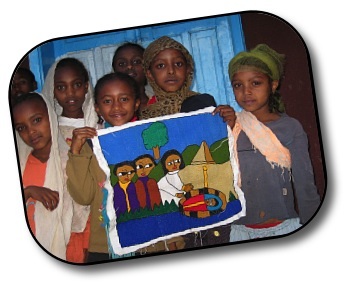 An American friend of mine who works in Ethiopia says that when they do identify themselves to her ( a known Jew) , they whisper that they are a part of the community (meaning the Jewish community). There are some who have become more bold about their Jewish faith– this web site was originally the idea of one of these men who desired to help his people to have better living and working conditions.